Today I awoke to a very nice surprise indeed. My Wii was flashing blue, letting me know I had a message. What I found was the announcement of the new “Kirby TV Channel”, exclusive to Wii. Well, only Wii consoles in Europe, Australia and New Zealand. The US misses out here. This is pretty exciting in my opinion. The channel is available for free download from today (Thursday 23rd), and will release an animated episode of Kirby every Monday and Thursday from now until December 2011. There are four episodes available at launch, with each episode being available for two weeks before it heads to the archives. But don’t worry, there is still a way to unlock episodes in the archives so that you don’t miss any. Come on inside for more details. 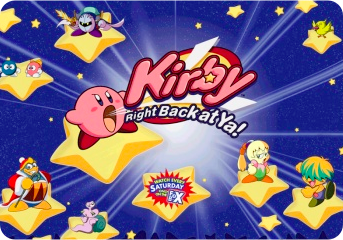 The US isn’t missing out entirely, because the series has already been shown there on 4Kids TV under the name “Kirby: Right Back at Ya!” Now Nintendo of Europe and Australia are airing the full series of over 50 episodes, which – as you’d expect from Kirby – is a conflict between the lovable pink ball and King Dedede taking place in Dreamland. So for those Kirby fans in Europe, Australia and New Zealand get to on downloading it now. You can set it up so that you get a reminder message every time there is a new episode. With Kirby’s Epic Yarn behind us now, we’ve got something to hold us over to Kirby Wii launches, and given that this ends on December 1st – I’d predict Kirby Wii is releasing soon after that. Now go to your Wii Shop and download!